Most schools across the nation appeared Wednesday to have rejected a set of controversial state-authored history textbooks advocated by impeached President Park Geun-hye. 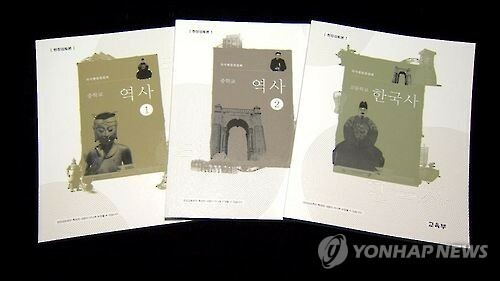 The textbooks for middle and high school students were unveiled by the government last month to correct what it said was a left-leaning, pro-North Korea bias in existing history textbooks made by private publishers. Liberals denounced the new textbooks as an attempt to glorify the military rule of Park's father and late leader Park Chung-hee who ruled the country for 18 years until his assassination in 1979. The education ministry said it would receive applications from schools wishing to adopt the textbooks for a trial period ahead of its formal release next year, but only three schools volunteered by Wednesday's deadline even after it had been extended once from last week, according to the country's 17 education offices. The three are all located in the southeastern province of North Gyeongsang, the traditional stronghold of Park's conservative party. One high school in Seoul made public its wish to use the textbooks and filed an application with the Seoul education office. However, the office rejected the application. In response, the school said it would buy the textbooks independently. The ministry said it is considering distributing the textbooks for free to schools that still wish to use them as supplementary educational materials. It plans to unveil the official tally of applications on Monday. Last week Education Minister Lee Joon-sik warned civic groups and the country's largest teachers' union, which was outlawed in 2013, that the government could take legal action if they tried to stop schools from adopting the textbooks.